Like the Battle of Waterloo, this dish will leave you blown-apart! Dan takes a classic dish and swaps out beef for some beautiful Roe Deer. Add in some fried vegetables and one of the most iconic of Scottish meals, haggis. Now you’re starting to look at one heck of a meal. When sitting down to enjoy this Scottish inspired meal don’t forget to grab yourself a wee darm! • Saute onions, shallots, garlic and thyme leaves until soft in butter. Add in mushrooms and cook until dry. Set aside to cool. Season with salt and pepper once cool. • Trim venison loin of any silverskin, season well salt. Sear in a hot pan with a little oil until brown all the way around – the venison should still be completely raw, just colored on the outside. Set aside to cool. • Roll out pastry until 3 inches larger all the way around than the meat and is ¼ cm thick. Brush one side of pastry with egg yolk wash. Lay sheets of prosciuttio on top, spread mushrooms across and lay venison on top. Roll pastry, crimp edges and egg wash the outside. Set aside in a fridge for minimum of 8 hours and maximum of 24 hours. When ready cook in a pre-heated oven to 400 for 15 minutes. Rest for 10 minutes. • Place haggis in a pot of cold water and simmer for 2 hours. Allow to cool in water for 20 minutes. • On a high heat brown bacon and vegetable oil. Add brussell sprouts and fry until golden all over, moving occasionally. Season with black pepper. • Slit haggis and scoop innards onto each plate. 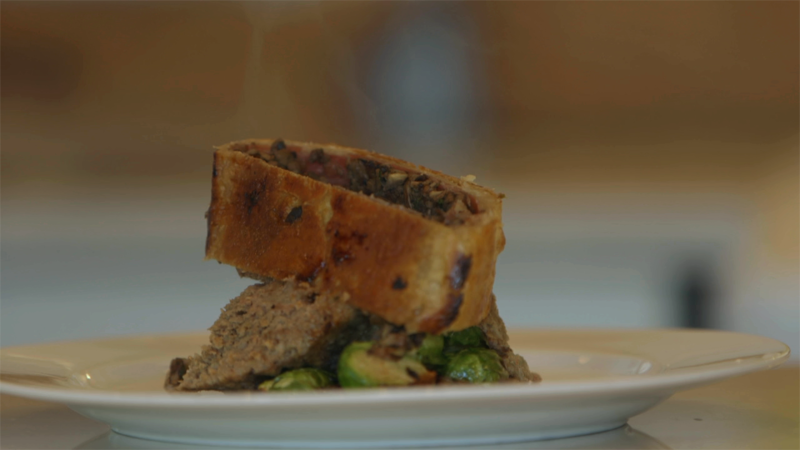 Place a slice of well rested wellington on top of haggis. Place a few brussel sprouts and bacon around plate. Dress with a wee dram.